Casino dealers are responsible for understanding the rules and premises of different games in the casino where they are individually assigned. They deal with the cards, dice, as well, as operating the game apparatus that is intended for casino play like roulette and baccarat wheel. Their duty does not merely focus on dealing cards and dices but they are also making sure that players are not cheating. Their job may look easy but how much is a casino dealer salary? 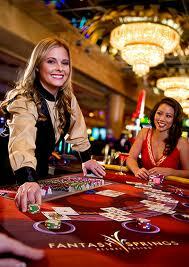 Read on and get to know the real deal about casino dealers. 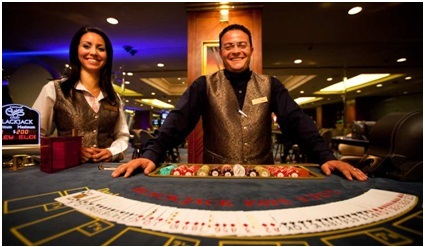 Casino dealers have individual duties and responsibilities depending on the type of game they are handling. This dealer is responsible for shuffling and dealing with cards. They are also in-charge of explaining how the game is played so that players will understand the rules of the game. Their other duty is to convert cash into chips, collecting lost bets and pay off the winner of the round. The dealer is also responsible whether a new deck of cards must be brought into the game table or cards should be reshuffled again. A blackjack dealer must be a good communicator to the players so that they will have a good time playing cards. Baccarat dealers are similar to barkers because they need to know the requirements of every position. In fact, you can find 4 dealers in a baccarat table. One dealer supervises the game; the other dealer mediates the game while the other 2 manage the winning and losing bets. Crap dealer is the most difficult job among the other casino dealer. A dealer who supervises this game must have advanced skills in math and has the ability to think quickly. Crap game requires 4 casino dealers as well, wherein one supervises the game in action, 2 dealers work in the public including cash to chip conversion and stake computation while the other dealer mediates the game in action. Casino dealers work in a palace of fortune where every player is hoping to go home with winnings. That is why many people think that casino careers are one of the most luxurious jobs to obtain because they are dealing with money. Casino dealers can work any time of the day. They can work during the day or night or weekends and holidays, depending on their availability to work. 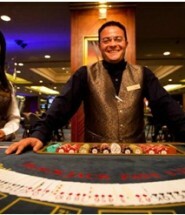 The average salary of a casino dealer is $17,030 per year if he works full-time. This can range into $14,660 to $31,960 not to mention the tips from the players. For part-time casino dealers, their average salary is $8.19 per hour. It can reach up to $15.37 per hour. This figure was based from the reports of Bureau of Labor Statistics in May 2009. A casino dealer earns the least if you compare it to other casino workers. Casino dealers have the biggest population in the entire casino industry. That is why they only earn minimal because of stiff competition. If you compare casino dealers with other casino workers, the gaming managers earned the most, followed by the supervisors, slot key persons, sports book runners then last are the casino dealers. However, the advantage of being a casino dealer would be the tips given to him during special events, and if there are special guests playing at his table. Casino dealers are also stable earners especially if they work full-time. If they know how to deal with their patrons, they can earn more than what they want and live comfortably. Their career is also a stepping stone if they have dreams of putting up their own small scale casino business since they know all the game rules, as well as, the operation on how a casino works. Why should you consider this job? There are many reasons why most people consider a casino dealer job although a casino dealer salary is quite low when compared to other casino workers. First, it does not require a certificate or a degree when applying to be a casino dealer. Second, the benefits are also high especially if you work for large corporations. Third, working as a casino dealer can be fun. If you are looking for a job at the moment, and you have the skills and interest to work in a casino – why not be a casino dealer today? Next Next post: What Is The Vegas Gambling Age?